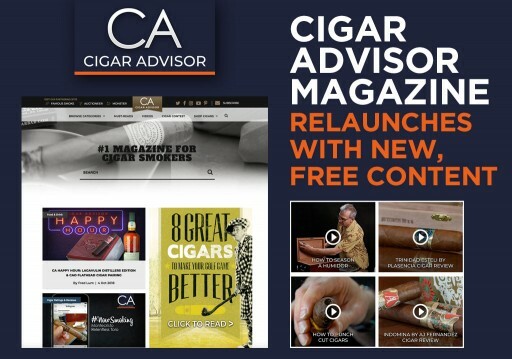 Based on the most popular videos at the Cigar Advisor YouTube channel, the two most commonly asked questions the magazine’s editors receive are “How to smoke a cigar” and “How to season a humidor.” Their free advice on these two topics has been viewed over 680,000 times; now, the Cigar Advisors have expanded their multimedia resources to include cigar recommendations for certain occasions, plus drink and cigar pairings. These are just a few of the featured tools offered for free at the newly overhauled Cigar Advisor website, where cigar lovers will now enjoy a faster, more satisfying visit when searching for cigar reviews, recommendations and cigar advice. "Cigar Advisor started 10 years ago as a simple blog page with a weekly newsletter. Today, it’s evolved into a full, free library of how-to guides and videos, cigar reviews and on-demand info," said Cigar Advisor Managing Editor, John Pullo. "Whether someone is new to cigars, or they’re a seasoned enthusiast – there’s plenty to discover at the new CigarAdvisor.com." · Cigar Buying Guides – retooled for a more robust mobile experience, it’s easy to take the CigarAdvisor.com’s Buying Guides into any local cigar shop for hassle-free help in choosing the right cigars - affordably. · Cigar Humidification – readers can learn how a humidor works, plus get quick, easy lessons on how to keep cigars fresh and ready-to-smoke. · Cigar Makers – more than articles on the people who make cigars, the Master Blenders tell their stories and experience in their own voices, and their own written words. · Cigar Reviews – users can enjoy long and short-form cigar reviews, videos, and in-depth compilations that cover entire cigar brands like Montecristo, Cohiba, La Gloria Cubana and more. · Cigars 101 – certified tobacconist-quality advice and answers to common cigar questions, plus the “basics” of cigar smoking: how to cut a cigar, how to light a cigar, and terms every smoker needs to know. A Food & Drink section supplements the magazine’s Cigar Pairing Guides with more ideas for matching cigars with wine, spirits and beer, while the Cigar Advisor “Must Reads” include tips on spotting fake Cuban cigars. The new site also offers guidance on FDA cigar regulations, plus free downloadable tools to help welcome newcomers to the premium cigar experience.